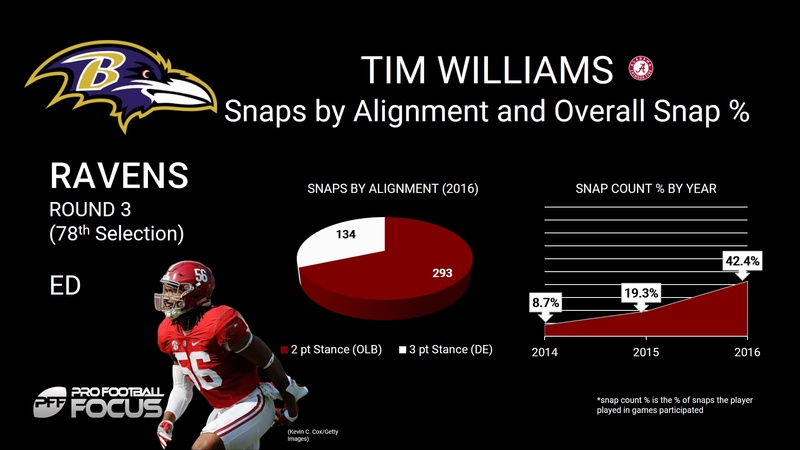 The Baltimore Ravens selected Alabama edge defender Tim Williams in the third round of the NFL draft Friday. Arriving from a dominant defense of his own, Williams recorded a pass-rush productivity of 16.8 (third in the class). He’s a complete player, making a stop on 12.7 percent of his run snaps, ranking second among edge defenders in this class. Williams is a fit in Baltimore’s versatile front, spending over a third of his snaps with his hand in the dirt on the edge (134 of 293 snaps). Although he was never a full-time starter (42.4 percent of snaps in 2016), Williams can make a major impact as a role player from day one. In total, he registered 59 pressures (20 knockdowns) in only 287 rushes.